SAN DIEGO, CA— IT Brand Pulse, a trusted source of research, testing and analysis about data center infrastructure, today announced the results of a total cost of ownership study. The report includes actual price quotes from SAN solutions from EMC, IBM, and NetApp, compared with five software-defined storage solutions from DataCore, Red Hat, Scality, SUSE and VMware. The study analyzes the cost of hardware, software and support for 250TB of storage, growing 25% per year, and used for backup to disk. 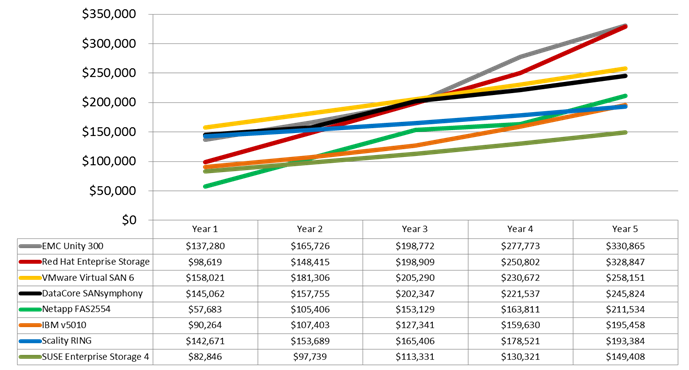 Detailed cost data is in the analyst report and can be downloaded here. The cost data says SUSE is the clear value leader led by best-in-class pricing model which includes support in the software license and, unlike others where license costs are front-loaded, the cost of a software is spread out evenly over the five years. IBM was the price leader for disk array solutions and only slightly higher than the lowest cost solutions from Scality and SUSE. Dell EMC, as expected, offered the most expensive storage solution for our bulk storage requirement. Popular enterprise software vendors Red Hat, VMware and DataCore, were three of the four most expensive solutions. Surprisingly, the Red Hat pricing less comparable to the SUSE version of Ceph software, and similar to premium-priced solutions from EMC, VMware and DataCore. TCO case studies are designed to provide busy IT Pros with vendor-independent data about the total cost of specific products. 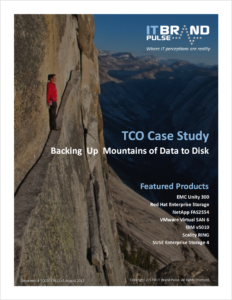 This case study examines eight comparably-equipped enterprise storage solutions: four from various disk array vendors, and four from software-defined storage vendors. It turns out one of the vendors stands out with lower TCO based on industry-standard hardware and attractively priced software licenses with support included. Requirement for this TCO Analysis: Backup All Data to Disk – As big data analytics become a common component of business intelligence applications, analytics vendors are asking customers to store ALL their data in order to get the best results from their analytics engines. As a result, the business of “backup” software vendors has changed to “data management.” Products from vendors such as Commvault, Dell EMC, HPE, Veeam and Veritas are aiming to track all the data in an enterprise, the applications that are using it, where it came from, where it’s going, and who is accessing it. The role of core backup applications has expanded to managing ALL the data in an enterprise, and the requirement for backup-to-disk is growing because real-time analytics needs the data to be online. 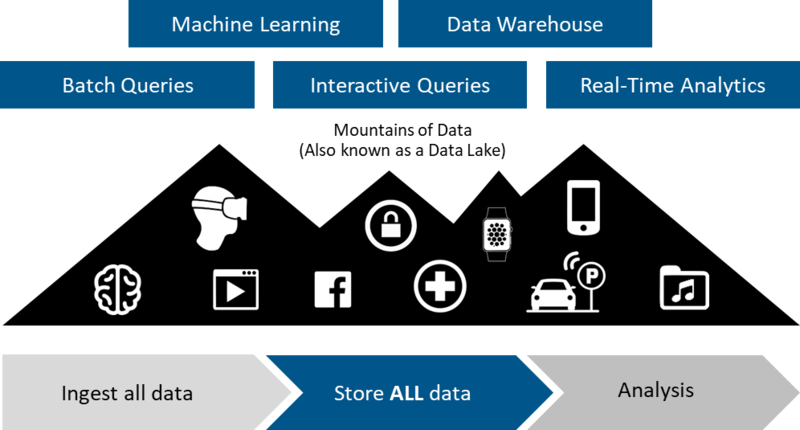 Looking forward, even small and medium enterprises will be trending towards storing ALL of their data online in order to leverage analytics capability that will exist in every business intelligence application. All major data management and protection vendors have the ability to backup data from application servers to disk arrays. What’s relatively new is the ability to backup data to software defined storage based on industry standard servers and object software defined storage. The new generations of solutions are far more open and scalable than previous generations of backup-to-disk solutions based on SAN storage. This case study will reveal if backup-to-software defined storage is more cost-effective. The software defined solutions evaluated in this report incorporate an architecture which uses object storage and industry standard servers. The solution shown below uses SUSE Enterprise Storage OSD and monitor nodes running on HPE industry standard servers. This report examines three disk array systems and four software-defined storage systems, including server hardware needed for hosting the software defined storage applications. The hardware, software and service products used in this case study all met the requirements specified in the RFQ. Differences in the products and services are described in the product overviews. Entry-level disk arrays were utilized because they met the performance, availability and useable capacity requirements of the backup to disk application evaluated in this report. If performance-oriented mid-range or high-end storage arrays were used instead, the five-year TCO would have been significantly higher. Dozens of features could have been added to all the configurations to enhance the performance (SSD), availability (replication) and useable capacity (compression and dedup). But a simple storage configuration met our report’s requirements for bulk storage, which is infrequently accessed. Hardware Product Cost – The purchase price for storage array chassis, servers and HDDs. Recurring Software License Fees – Annual license fees for software, if applicable. Recurring Annual Service & Support Fees – The cost of a service agreement providing on-site service and spare parts, with next business day response time. Training – The cost of certifying one network engineer for this class of product (not applicable in this report). Spare Parts – The cost of on-site spare power supplies and SFPs (not applicable in this report). Total Cost of Ownership – The sum of the hardware product cost, software license fees, service and support fees, training, and spare parts over a five-year period. The Unity 300 may be Dell EMC’s most affordable array, but that is like saying the C-Class is Mercedes’s most affordable car starting at $40,000. In addition, this system is not optimized for bulk storage. You can scale but with only fifteen 6TB drives per chassis, this results in the need for at least 1 new chassis every year. The low-cost hardware foundation used for Red Hat Ceph Storage is exactly the same as the configuration used for other software-defined storage solutions in this analysis. The result of the capacity-based software pricing model is the second most expensive solution for our requirement. If support was included in the price of the software license—like it is with some other software-defined storage products—Virtual SAN would scale cost effectively. But it’s not; and the result is the cost of support exceeds the cost of the base product over a five year period. DataCore software is offers industry-leading performance for database/transaction processing workloads, and is priced accordingly. The storage capacity-based licenses add-up over the 5-year period to make SANsymphony the 4th most expensive solution we evaluated. NetApp FAS2554 gets top marks for ease-of-use and for offering high-density configurations which should make scaling mass storage cost effective. But customers are asked to pay a hefty premium for the NetApp brand. For example, add-on 8TB drives for a NetApp FAS2554 can run well over $2,000 — over four times the cost of add-on drives for industry-standard servers supporting software-defined storage. If our application needed the additional features rolled into the v5010, this product might represent the best value for the money. But for our application—which requires the most capacity for the lowest cost—software-defined storage solutions are the ones to beat. The solution from Scality is the second, best-priced solution we examined. The difference between Scality, and price leader SUSE, was the cost of support. It’s also worth noting the cost of Scality software is entirely front loaded, while the cost of SUSE software is spread out evenly over the five-year period. SUSE offers several layers of cost savings to enterprise storage IT professionals. The foundation is industry standard hardware. Layered on top, is storage software with comparatively low annual license fees spread out over the life of your storage. Finally, support is included in the cost of the software license. For applications generating a lot of data, SUSE Enterprise Storage 4 scales capacity but not cost. IT organizations have shown a strong preference for branded storage. Everyone knows they’re paying a tax for the EMC or NetApp logo, but because they deployed the “Mercedes of storage arrays”, they also figure they won’t get fired when something goes wrong. This branded storage tax is applied to every disk drive a customer purchases during the life of the system, and is as much as 4x the cost of HDDs used in industry-standard servers and software-defined storage systems. The chart below shows a side-by-side comparison of eight disk backup solutions based on pricing provided by the manufacturers or their channel partners. Surprisingly, 2 of the 3 most expensive solutions were SDS products (not surprisingly from traditional enterprise vendors), while the clear price leader for this class of solution was SUSE Enterprise Storage 4. The data in this report indicates that traditional enterprise storage is under tremendous price pressure from software-defined storage available from vendors like SUSE, especially for capacity-driven solutions such as disk backup. This report also reveals that Red Hat and VMware are positioning the price of their software-defined storage offerings at parity with traditional (expensive) enterprise storage solutions. The bottom line? IT organizations looking to lower the cost of disk backup should evaluate software-defined storage solutions. Based on easy-to-service x86 servers, the technology is proven by hyperscale public cloud providers and can be deployed in private clouds for 1/3 the cost of branded storage. Frank Berry is founder and senior analyst for IT Brand Pulse. As former vice president of product marketing and corporate marketing for QLogic, and vice president of worldwide marketing for the automated tape library (ATL) division of Quantum, Mr. Berry has over 30 years’ experience in the development and marketing of IT infrastructure. If you have any questions or comments about this study, contact frank.berry@itbrandpulse.com. For reviews on IT software such as API management software, visit trustradius.com.